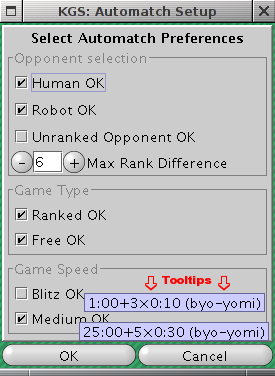 The ' automatic opponent choice ' (automatch), which in the main window under ' Play GO ' is selected, supplies you with the fastest way to get a match with an opponent. Auto Match can be toggled with [ctrl] [N]. If ' automatch ' is active, ' Play Go ' the Circle in the menu title will spin and have two lines through it. Note! As soon as Automatch finds an oppent the game will begin, it must be played! If you close the game it will be counted as an escaped game, even if no stones were played!